Mitt Romney picks up endorsement from another one-percenter, the infamous former president George W. Bush. As presidential endorsements go, this one could hardly have been more low-key. ABC News caught up with former president George W. Bush in an elevator in downtown Washington on Tuesday and asked the question that elicited the sound bite. Bush’s absence from this year’s presidential race stands in sharp contrast with his predecessor, who has stayed in campaign mode pretty much since he left office. In 2004, Bill Clinton appeared at a Philadelphia rally with Sen. John F. Kerry (Mass. ), the Democratic nominee, only seven weeks after having quadruple bypass surgery. “If this isn’t good for my heart, I don’t know what is,” Clinton told a cheering throng of more than 100,000. Despite the fact that his wife lost the Democratic nomination to Barack Obama in 2008, Clinton has eagerly stepped up as a validator and fundraiser for the current president in his bid for reelection. Then again, campaigning is such a part of Clinton’s DNA that he has even been willing to host fundraising events for state Senate candidates. Don’t expect to see anything like that from Bush. “We welcome the president’s support, as we welcomed his father’s” in late March, when former president George H.W. Bush bestowed his formal endorsement on the all-but-inevitable GOP nominee, said Romney campaign spokeswoman Andrea Saul. That the younger Bush has stayed invisible reflects both political reality — he remains far from popular among much of the electorate — and his sense of what his role should be as a former commander in chief. Richard B. Cheney, his vice president, emerged as an early and vocal critic of the Obama presidency. It is far from clear whether it would help Romney if Bush took a more public role in a campaign in which the state of the economy is the top concern for voters. 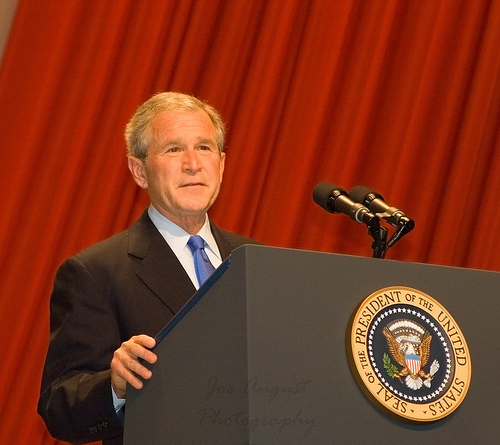 In a February poll by Quinnipiac University, 51 percent of respondents said Bush is more to blame for it, while only 35 percent said Obama is. Meanwhile, many on the right have come to view Bush’s presidency as a time when the size of government and federal spending expanded — which is precisely the rap they are trying to pin on Obama now. None of that is lost on the former president. Meanwhile, the former president whose name Romney was invoking with approval at a campaign stop in Iowa on Tuesday was Clinton. For all their differences, Bush and Clinton have something in common as they decide how to approach this election season: an awareness that their family name is on the line, along with their presidential legacies. Two of the potential presidential candidates most often mentioned for 2016 are former Florida governor Jeb Bush, the brother and son of two ex-presidents, and Secretary of State Hillary Rodham Clinton, whose husband is said to be eager to see her make another bid for his old job. As he indicated in his speech on Tuesday, Bush appears to be enjoying a retirement in which he maintains a busy speaking schedule, although his remarks are rarely open to the public. He is building a presidential center at Southern Methodist University in Dallas that will include his library and an institute focusing on education reform, global health, human freedom and economic growth. Bush made it clear soon after he left office that he had little appetite for electoral politics — or, unlike some former presidents, for meddling with those who followed him in the White House. In “The President’s Club,” a recently published book on that exclusive society of those who have known what it is like to preside in the Oval Office, Time magazine journalists Nancy Gibbs and Michael Duffy wrote of a White House lunch of former presidents that Bush arranged, at Obama’s request, shortly before the current president was inaugurated. It was the first time all the living presidents had gathered at the White House since a ceremony marking Egyptian president Anwar Sadat’s death in 1981. “The conversation turned less on policy and politics than simply on the difficulty of making a home in Washington,” the two authors wrote. Polling director Jon Cohen and research editor Lucy Shackelford contributed to this report.